Huge news: the world's largest palm oil company has just promised to stop destroying the rainforest. Now we need to make sure it actually happens, or it could be too late for the orangutans. After six months of pressure from SumOfUs members, Wilmar International -- called by Newsweek the world's "least sustainable corporation" -- says it will act to save the rainforests of Southeast Asia. It's a huge step forward, but the fight's not over yet. If we stop campaigning now, Wilmar and other companies might never implement these landmark promises, and the rainforests will continue to be destroyed. That's why we have to keep fighting. We know our campaign is working, but to stay strong and independent we don't take any money from governments or corporations -- meaning that without your continued support, this work won't happen. Can you chip in just $1 now to make 2014 the year we end destructive palm oil production and save the orangutans? This wouldn't have happened without all of us. For decades, Wilmar has been destroying the orangutan's last home. It had to stop, but we knew that nothing would change until companies like Kellogg's -- who buy Wilmar's palm oil -- demanded it. Our sustained pressure made sure these companies acted. Thousands of us helped fund a report showing how Wilmar's suppliers were bulldozing the rainforest -- then shared the report with hundreds more consumer companies and demanded they act! And it's working! With Kellogg's and others demanding action, Wilmar has just committed to zero deforestation policy. The palm oil industry is a disaster for people and the planet. Deforestation in Southeast Asia is pushing the orangutan, the Sumatran tiger, and countless other endangered species to the brink of extinction. Indigenous communities have their land stolen and their livelihoods destroyed by palm oil plantations. Meanwhile, the remaining forests of Indonesia are storing as much carbon dioxide as the entire earth emits in a year, meaning that allowing the destruction to continue could detonate a carbon bomb. Now we're starting to change that. Wilmar controls nearly half the world's palm oil trade, so this could represent a sea change in the industry, but the fight's not over yet. If Wilmar follows through on its commitments, it will start freezing out plantations that rely on destroying forests and seizing land from local communities. Since it's such a big buyer, a huge number of plantations will have to pay attention. But implementation will be tough, and we'd be foolish to blindly trust Wilmar -- so we need to keep monitoring Wilmar closely to make sure it lives up to its promises, and be ready to hit the company if it doesn't. In response to our pressure, Kellogg's -- one of Wilmar's top business partners -- played a key role in pushing Wilmar to act. But it still needs to finalize its own policy ensuring that it won't buy dirty palm oil. Dozens more companies need to commit, as well. We know this campaigning is working -- but if we're complacent now, we may not stop the ongoing destruction before it's too late. That's why we have to keep going. 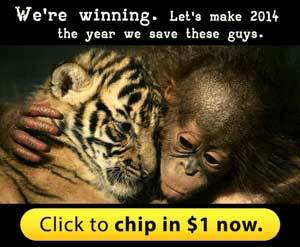 Chip in $1 now so we can keep campaigning to save the orangutans, and keep winning in 2014. Thank you so much for all you've done. This wouldn't have happened without you.